For some years my mother has lamentedand this is not too strong a wordthe fact that I never studied Latin. Whenever she spies a phrase in Latin inscribed on a church facade, or comes across a quote in a book or article, or hears an unfamiliar Latin hymn during a Mass, and I am unable to translate it properly, she will inevitably sigh. All that Jesuit training, she’ll say sadly, and you still don’t know any Latin. I just can’t believe it. Normally I point out that, having entered the Society of Jesus at an advanced age, I hadn’t as much time to take up ancient languages as did my forebears, who entered at 16 or 17 and had plenty of opportunity for their Cicero and Ovid. Moreover, there are many scholars, Jesuits and otherwise, who know Latin far better than I ever could. Even if I studied for many years, I would not be able to match the accuracy of their translations. So better to rely on these. Sadly, these explanations fail to satisfy. And when I remind my mother that I do in fact know a few other languages, including a smattering of Greek, and can even translate some of the New Testament, she will frown as if this is clearly beside the point; besides, who ever heard of any Attic Greek hymns being sung during Mass? Lately, though, I’ve been thinking that perhaps my mother is right after all. I could use some Latin. Not for my work, as she might suspect, but rather for my day-to-day life in Jesuit community. For, as it turns out, nearly everyone in my house seems to speak this supposedly dead language. In the past, when Jesuits entered the order after high school, they would first complete novitiate and then be sent to the juniorate, a two-year, college-level program heavily oriented toward the classics. And not only did the juniors study Latin per se, but many of their other classes were conducted in Latin as well. You have to admit this is pretty impressive: geometry, you’ll recall, is hard enough in English. 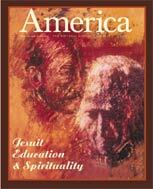 Of course there is still much Latin that endures in the everyday language of American Jesuits, both young and old. First-year novices are still called primi, second-year novices secundi. During weekends in most novitiates one does manualia, not housework. One completes informationes (personnel evaluations) on men preparing to enter another stage of formation. The other night a Jesuit in our house spoke of a meeting with the formatores, that is, those responsible for Jesuit formation, and everyoneincluding meknew what he was talking about. But living in my particular community, including as it does so many classically trained seniors, can be daunting. Last month a note went up on the community bulletin board headed by the phrase Ne auferatur. Now I knew it meant don’t do something, but what? Don’t do what? It looked like Nosferatu but I figured it was highly unlikely that our superior had posted a note referring to a 1920’s German expressionistic horror film. Finally someone saw me staring at it and said, Don’t remove. Only a few days later another Latin note went up on the board which said...well, I have no idea what it said. So whatever it was asking me to do, I certainly haven’t done it. While much of this is simply confusing, I have discovered that there is an excellent spiritual benefit from my ignorance in this area. It does wonders for my humility. Or, as my mother would undoubtedly prefer, my humilitas. This article also appeared in print, under the headline "Of Many Things," in the May 26, 2003 issue.